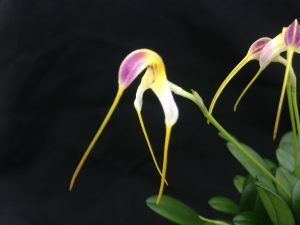 Masdevallia ludibundella is a miniature masdevallia with large dramatic flowers (the plant here is in a 3cm pot). 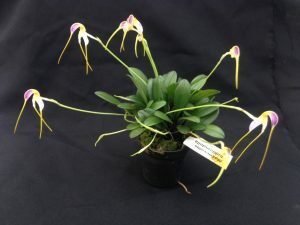 The species comes from Colombia and enjoys the cool wet conditions that most of our masdevallias enjoy in the Cool Americas section of the greenhouse. The flowers are long lasting and held well clear of the leaves. Given conditions it likes the plant multiplies quite quickly too – a brilliant little species.